Varidesk is one of the important players in the office space marker. It manufactures a range of products which includes standing desks, sit/stand converters, seating, wall panels, and office accessories. There is a sense that the brand has covered most needs of the modern office worker. Unlike the classic office employee, the modern worker wants minimalistic products which are practical, durable and which also look apart. It seems that Varidesk has ticked these boxes, maybe more than other similar brands. Every manufacturer has its own strengths. Varidesk is no different. The brand offers a monthly payment system for its products. Clients can choose the products they like and begin paying monthly fees to manage larger purchases. There is also a 30-day guarantee on most products from the manufacturer. While other manufacturers have some type of money back guarantee, Varidesk also offers free shipping for its products. But maybe most importantly, Varidesk has become a one-stop destination for all office furniture needs. A complete workspace can be designed using Varidesk products. A height adjustable standing desk can be purchased together with an office seat. 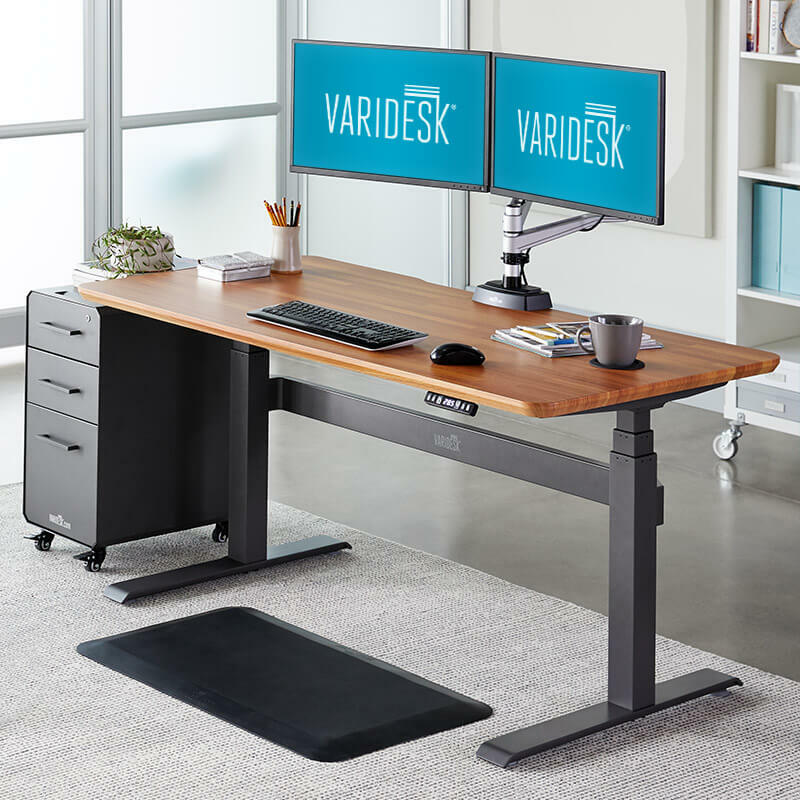 Monitor arms and standing mats are also available from Varidesk. Companies purchasing products in bulk can also benefit from certain discounts. These discounts can be established on a case by case approach. Apart from these distinct advantages, Varidesk also has its own ethos as follows. It has been proven multiple times that staying active at the office is better for overall health and even for productivity. All Varidesk products are designed so that they motivate workers to move more. Instead of offering stagnant solutions which could be easily not the best when it comes to health, the manufacturer offers products which are made for extra energy. Movement can be encouraged through designs such as those of the adjustable standing desk or even by a standing mat. Such a mat makes standing more comfortable. But the movement can also be encouraged with better seats, which Varidesk already manufactures. Movement is seen in other solutions such as the portable desk from the manufacturer. Even the monitor arms and other accessories are made with plenty of freedom for movement and good adjustability. In many situations, this proves quite important as all elements working together encourage movement, even if it only is in the immediate vicinity of the office space. Another Varidesk principle is based on adaptability. Many brands have seen that adaptable office solutions are valued by customers. They now offer adaptable solutions for people of various heights. Varidesk is no different as it joins the trend of maximum adaptability. With different height settings and various other adjustments which can be made in order to maintain a correct working position for hours, the manufacturer offers a better perspective on what can be achieved when each product is truly designed to be adjustable. There are many alternative brands on the market but not all of them manage to come with no or minimal installation. Varidesk prides itself to be one of the brands which need the least amount of work to show good results for desk and other products’ installation. Even so, the few steps which are required to put the office furniture together are straightforward. They are also joined by a simple step by step plan or instructions manual. There is no need to call for a specialist when the products can be assembled even by novices. As a result of these beliefs, Varidesk has managed to create products with very good feedback. Pricewise, they are not the most affordable in their class. However, their benefits are reported by most Varidesk customers. Improved work productivity seems to be among the first effects mentioned by its customers. It is known that a healthier person who is in a better mood is also more productive. Staying active maintains good health and good mood. This is why Varidesk products are often tied to improved productivity. Another interesting aspect of Varidesk office products is given by a happier office culture. With more Varidesk products around the office, the mood of the team can improve. Since the brand also offers a range of accessories, it can also be one of the most interesting options for those who want to improve office cohesion between workers. From a company’s perspective, this can be highly valuable. A happy office is a productive office. Varidesk standing desks are among the most popular products from the company. These types of desks have been constantly growing in popularity during the past few years. Even more, they can be among the best products when it comes to better investments for all workers as they can be used even in spaces which work with shifts. The Prodesk is one of the popular Varidesk choices. It comes with one of the most simple and most efficient approaches from all similar desks on the market. It only takes a few minutes to install, which places it among the most practical designs in its class. Some even argue that the Prodesk is the fastest assembly standing desk on the market. Of course, such quick installation is mostly based on simplicity. This is the case with the Prodesk as well. But even in these conditions, the standing desk offers plenty for the buck. First of all, the chosen materials are of commercial grade. This means that they are more durable. Unlike the materials for the home user, these commercial materials used in the standing desk are actually suitable for intense use. Of course, not every person is going to use the standing desk in the same way. However, some may simply find it easier to have a reliable desk to use for years instead of upgrading every couple of years. The standing desks from Varidesk are also stable. 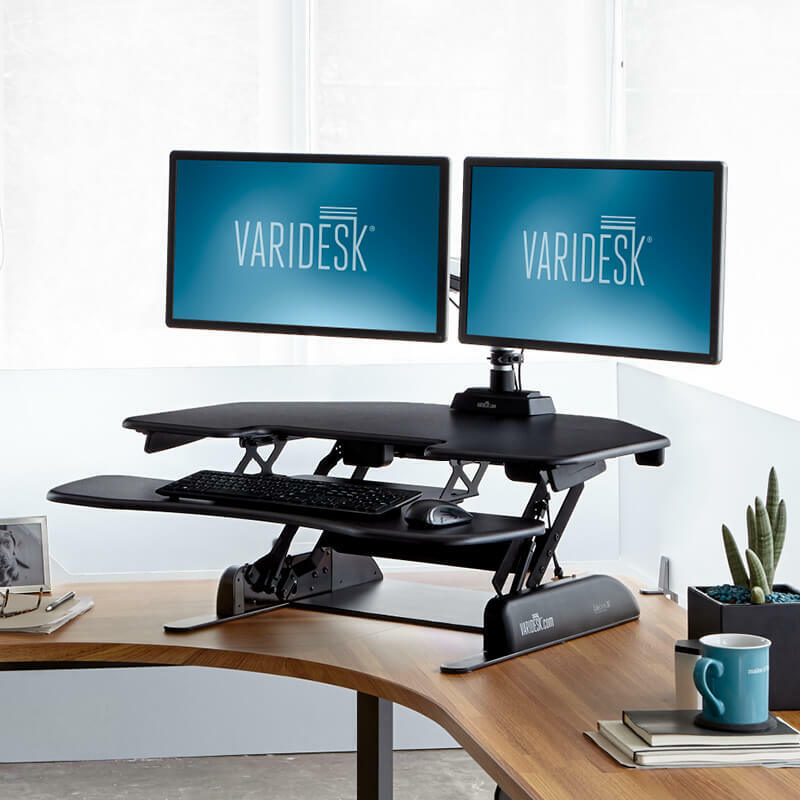 Of course, perfect stability is hard to really deliver at these heights for many brands, but Varidesk is among the good ones from this perspective. Unlike many other brands which are simply struggling when it comes to stability, Varidesk has a good balance to its designs, especially when loaded correctly. Varidesk is also one of the few manufacturers offering office walls and panels. These separators are used to create smaller intimate spaces in modern large offices. They are not specifically sophisticated but they are made from quality materials. As the office furniture, these panels are also easy to install. Modern open spaces might need to be compartmented for better productivity. They can also be used to create smaller offices. In most cases, Varidesk offers a more complex approach which is often worth taking into consideration, especially when it comes to proper segmentation of the office space. Certain companies have employees working in teams. These panels can be used to create separate spaces for each team. Furthermore, they can also offer a more complex approach when it comes to design freedom. Working with an interior designer, offices can create their own custom space with these Varidesk panels. With a lower price and quick installation process, this can be a cost-effective solution for new office spaces. There are many benefits to the culture Varidesk brings to the office. However, there are also areas of improvement, as with any other brand. There are a few key points which can be improved from the customer’s perspective. However, one of the areas to address comes with the seat selection. Of course, Varidesk promotes standing at work. But even so, their seats are a bit outdated when it comes to design. Their materials are fine as they are durable, but the design of the seats needs to be updated in order to stay on the same playing field with the competition. At the same time, not all workers want to stand all day and they would need traditional office seats as well. Varidesk struggles to offer such solutions at the moment. Since it is known that combining sitting and standing is the best for better posture, Varidesk needs to introduce more up to date seating. Classic tables are also offered by Varidesk. They have no height adjustments and they can be used across the office in places such as meetings rooms or in the cafeteria. But at the same time, these products are too expensive for what they offer. Even with a wooden top, they are still not very affordable. It has been pointed out that these tables can come in more affordable alternatives as well. The range of accessories has also been considerably improved. Even if it is not the most complex at the moment, the office accessories made by Varidesk are now seen as qualitative. They are still not the most affordable on the market but they can be seen as more than just typical entry-level accessories. 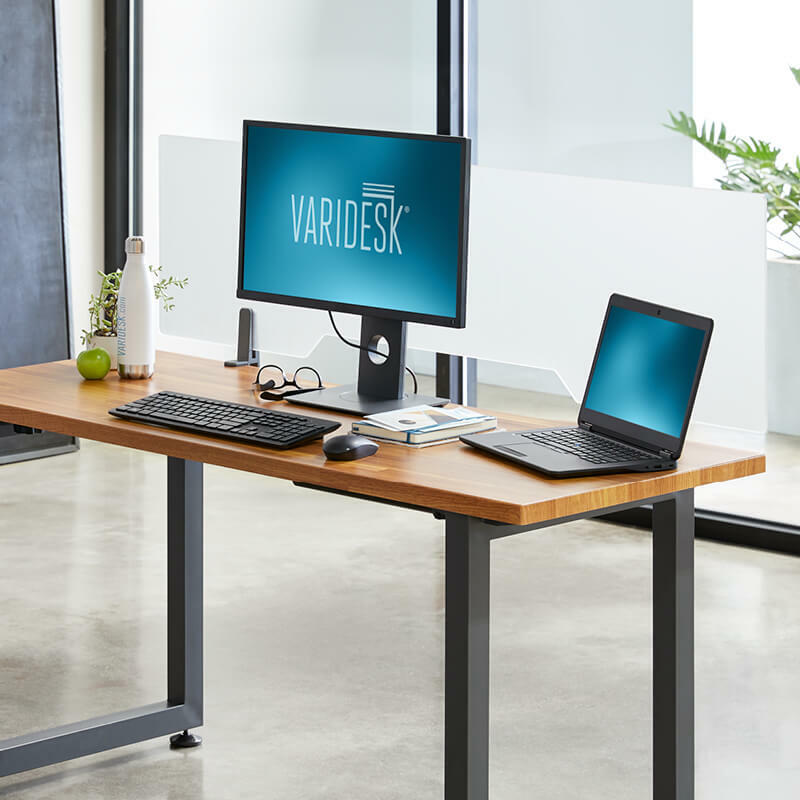 Varidesk is not the typical affordable office brand. It has managed to establish itself as a mid-market brand with plenty of quality products on offer. Based on quality materials made at commercial standards, both the desks and the chairs can be solutions for any type of office. Most importantly, Varideks has also integrated interesting designs in each range. This is why its products can be used both at the office and at home, for those who prefer to work on their own. Furthermore, there are a few other furnishings on offer apart from desks and chairs. Varidesk tables can be used across various spaces to create a modern look which is durable and appealing. Of course, creating these spaces might not be the cheapest with Varidesk. But since there is a system in place for monthly payments, there are no real excuses left for those who truly want to make the most of their experience at work. Going back to the ethos of the company, it seems that Varidesk has managed to create products which stand by the creed of the company. They are reliable, easy to use, easy to install and highly adjustable. These qualities recommend Varidesk products both for individuals working to improve their own office space and for companies who need bulk purchases to offer a happier working space to their employees. With great communication, the company has a bright future.